Posted in: Bug Info, Computers, Helpful Hints. These instructions let you figure out what is overheated about your system so it can be fixed. The first thing you need to figure out about your system overheating is whether it is the CPU or the GPU. To do this you can use HWMonitor at this WebSite. You may already have this program on your computer. Check first before you to to the trouble of downloading it. Click the DOWNLOAD button. This is not an installer, but just a ZIP file. So unpack the zip and you can run the program. Make a link on your desktop or in your start menu if you like. The program will require you to authorize it since it requires kernel access. Also it takes a while – a few seconds – to connect to the sensors. You should see something like this. 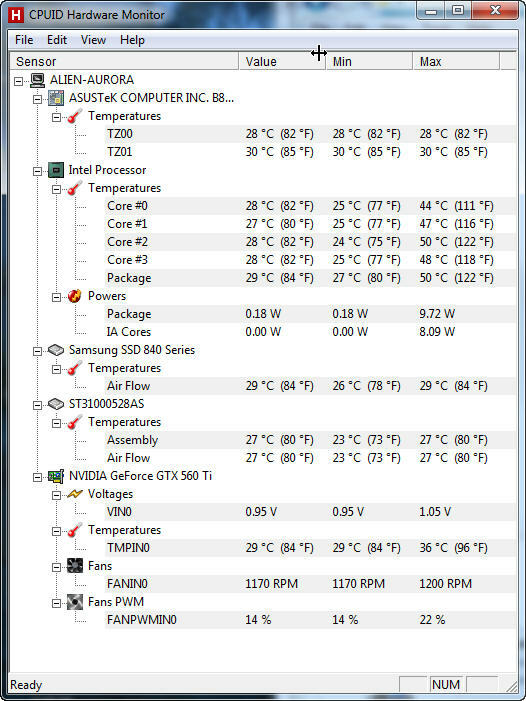 We want to figure out whether it is the CPU or the GPU that is overheating when you run a game or other activity on your computer. 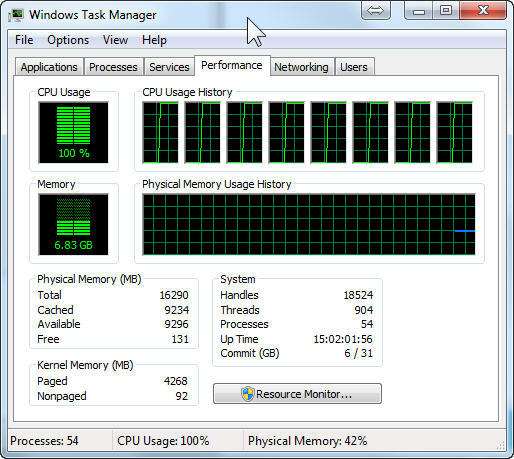 First, let’s load only the CPU, not the GPU with a program that I wrote a while ago. Then download the CoreHeaterQt_V1_2_Setup.exe file from the list. And run this to install the program. Also choose Install Desktop Icon to make the program easier to access. So this is testing your CPU only. The GPU is not getting any work to speak of with this program. Let the program run for a few seconds. Say 30 secs to a minute is plenty. The CPU will heat up very fast and you should hear your fans speed up right away. Stop the CoreHeater with the stop button after a few seconds and look at the sensor data. Take a screen shot of the HWMonitor window to preserve it. We are looking for the CPU max temperature so look on the lines under the Intel Processor section for the max temperatures. Over 200F is a problem. As you can see above, the temps on my system never got above about 120F during the test. Now run a game. Any game will do. And after a few seconds or minute, when things bog down as we noticed, stop the game and take another screen shot of HWMonitor. Notice whether the GPU temperature has increased. Look on the lines in the Nvidia GTX Temperature section. Did the CPU or the GPU get the hottest? 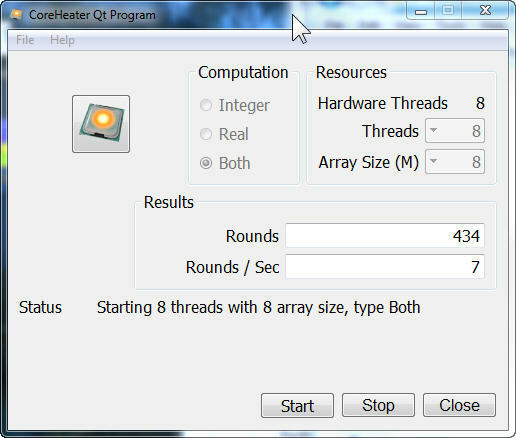 Did the CPU get hotter with the game than with CoreHeaterQt? The GPU should have gotten hotter with the game and not hot at all with the CoreHeater test. Take a screenshot to preserve your results. The block on the right bolts to the CPU chip and the fan bolts in the back or top of the cabinet. There is a radiator behind the fan to carry the heat away. If the plumbing leaks, and the fluid leaks out, then the cooler will not cool the CPU enough and it heats up when you load it. The GPU has an air cooling system. The fix for either problem is to just replace the part. 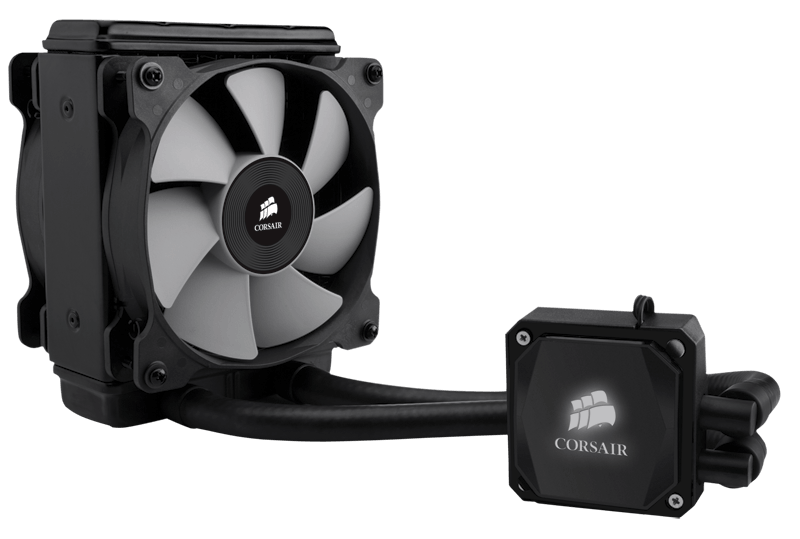 The Cooler costs less than $100, and the GPU costs about $300. I’m guessing it’s the cooler that is the problem. Since your system is so large and heavy, I’m guessing DELL will want to send someone out to fix your system at your house. If they want to ship it, tell them NO. If you ship it, it will be gone for two months while they mess around and ship it back. For about $100 or $300, you can fix the problem yourself in a couple of hours and the system will be fine. I’ll walk you through it on video while we fix it.